The actress who had earlier deleted all photos and videos of her husband, including the ones they took together from her Instagram page, misled the public into thinking that her marriage was wading through troubled waters; generating mixed reactions from fans and critics alike. Given the fact that Mercy Johnson had beforehand on many occasions, uploaded romantic pictures and videos of herself and her husband, gave rise to the speculations that something may be amiss. 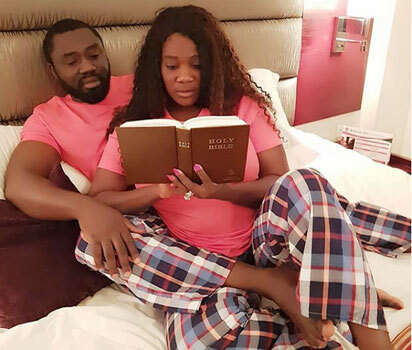 However, the mother of three lovely kids has debunked the rumour by sharing a picture of herself and her husband studying the Bible on the same Instagram page. According to her, it is nobody’s business whether or not she deletes pictures from her Instagram page. “Okay, there is God; in this New Year? Wish me good. That’s not happening! Is it your delete? Must I ask for permission to post new pictures”, she wrote.